There are certain documents that we need to keep safe at all times. From wills to property deeds to life insurance policies to immunization records and other important forms, it is imperative these documents remain safe during a move. Some of these documents are irreplaceable and it would a shame to lose them, while others are essential to your and your family’s overall well being. Make replicas. 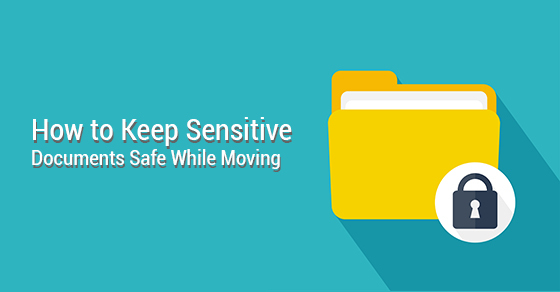 Before you move, make copies of all your valuable documents. Besides paper copies, scan everything and save a version to your computer. When it comes to sensitive documents you can never have too many copies. If you lose the originals during the move at least you will have an electronic version saved to your hard drive as a backup. Protect your documents in plastic. Purchase folders that you can use to safeguard your papers. Plastic folders offer protection and your papers will be easy to remove. Some people even go as far as laminating their important forms but only do so if it’s absolutely necessary. Sealed them in a protective pouch with key. These pouches can be found at hardware and office supply stores. They are what people who handle money use for transporting large sums to and from locations. These pouches come with a key that you can keep with you. Rent a storage space for your special forms. It may seem excessive to rent a storage area just to house sensitive documents while you move but in reality, it’s one of the safest options. When you rent a storage unit, you will be the only person who has access to it. Buy a small, fireproof safe and store your valuable papers inside it. An added bonus is that you can also leave other treasures and keepsakes like jewelry, priceless family heirlooms and photographs in a storage unit. Storage units give you peace of mind so you don’t have to worry about your valuables while you’re in the process of moving. Make a list of everything you’ve stored and where it’s located. Keep this information on your phone or computer, somewhere that it can be password protected. Use codes and/or abbreviations so should your phone fall into the wrong hands no one will be able to decipher where you’ve left your valuables. Overall the most important thing is to simply be smart. Ensure your documents are somewhere secure and where very few people have access to. When it comes to keeping private information private, logic is key!